This model is from the largest manufacture of hearing aids in the world. This LATEST DESIGNED TOUCHING model is Ready-To-Wear, 100% Pure Digital, Mini Size, Super High Power, Behind-The-Ear hearing aid. It suits for moderate to severe hearing loss. 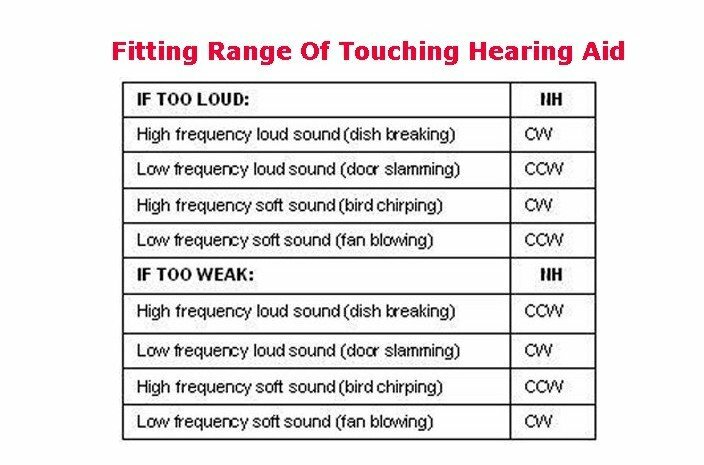 TOUCHING provides superior sound quality with low distortion – at a very competitive price. Unique in its class, TOUCHING uses a highly advanced feedback cancellation system, for comfortable hearing. Learn how to choose the best hearing aids . How to adjust the hearing aid trimmer ? Some problems of this item asked ..
Can you please tell me what the very small blue or red plastic clips are for. They are packed in a small plastic bag. There is one included with the Touching and two (1 blue and 1 red) included with each 13p & 13SP. Answer: The small bule and red plastic clips are for customer to distinguish the hearing aids . If he both ears have problems and need 2 pcs hearing aids ,then Usually left ear uses blue ,right ear uses red . TOUCHING: Can you please tell me what the function is of the push button Rocker switch located above the volume control? Is it a 2 tone control (normal & high) or a tele-coil when using the telephone. Answer:Toching just has 2 functions ,Soft and Lound . It doen’t has functon of Tele-coil when using the telephone.